In November 1968, George Harrison released “Wonderwall Music”. A soundtrack to an art film called “Wonderwall” this predominantly Indian music collection was the first solo album to be released by a Beatle and also the first album on the newly formed Apple Records. George would continue to release albums on Apple (and EMI) through to 1975’s soul-influenced “Extra Texture (Read All About It)” touching on experimentalism with “Electronic Sound”, the magnificent triple album “All Things Must Pass”, the chart-topping “Living In The Material World” and the, perhaps, less well-known “Dark Horse”. This box brings all these eclectic albums together in one set that mirrors 2004’s “Dark Horse Years” box set and will contain a perfect bound book with a DVD. All albums have been remastered by Dhani Harrison and Paul Hicks and all will be packaged in high-quality card packs and all albums, apart from “All Things Must Pass” and “Living In The Material World” contain newly written notes by Kevin Howlett. The DVD contains a brand new, never before seen video which has been painstakingly overseen by Olivia Harrison and all packages contain new photos – many never seen before. 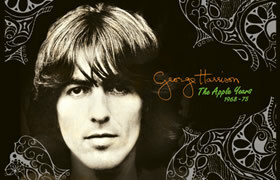 Universal Music Group and the Harrison family are proud to announce that George Harrison’s first six solo albums, released between 1968 and 1975 on The Beatles’ Apple Records label, have been digitally remastered from the original analogue masters for CD and digital release on 23 September by UMG. Wonderwall Music, Electronic Sound, All Things Must Pass, Living In The Material World, Dark Horse, and Extra Texture (Read All About It). Released in November 1968, George Harrison’s Wonderwall Music was the first solo album released by a member of The Beatles and the first LP to be released by Apple Records. The soundtrack music for director Joe Massot’s debut feature-length film, Wonderwall, the predominantly instrumental album is an intricate, vibrant tapestry of Western rock music and compositions in an Indian classical style. In 1992, George recalled, “I decided to do it as a mini-anthology of Indian music, because I wanted to help turn the public on to Indian music.” Three bonus tracks have been added to the remastered album: “In The First Place” by Liverpool group The Remo Four, who played the rock elements of the recording sessions, a previously unreleased alternate take of “The Inner Light,” (Beatle Brunch is VERY excited about this track!) and the previously unreleased “Almost Shankara,” a raga that was not used in the film or for the soundtrack LP. The booklet also includes a new essay of appreciation by the acclaimed musician, producer and composer Nitin Sawney and newly written historical notes by Kevin Howlett. 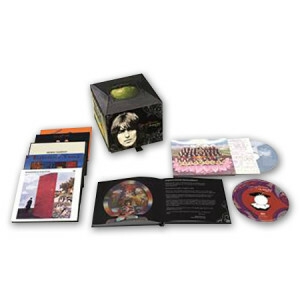 Designed to complement Harrison’s 2004 collection, The Dark Horse Years 1976-92, the new box features an exclusive DVD with several video pieces, including a new seven-minute film with previously unreleased footage. The Apple Years box also includes an exclusive perfect-bound book with an introduction by Dhani Harrison, new essays by award-winning radio producer and author Kevin Howlett, and rare and previously unpublished images. See Olivia Harrison at 2:23 into this video for Crackerbox Palace (not part of the new Apple Box). Beatle Brunch will be offering the full box set as a grand prize to a member in the Beatle Brunch Club, join up now at www.brunchradio.com we will also be featuring songs from the set as well as interviews with those involved in its reissue. Don’t get to hear Beatle Brunch where you live? Go to this station’s page and find a local radio station that streams the show at a time that’s convenient for you, or join The Beatle Brunch Club and hear every week’s show on demand.